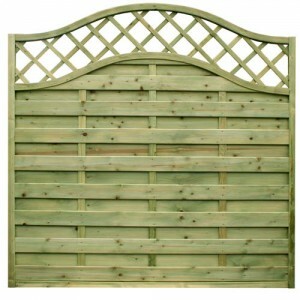 Neris Decorative Fence Panel - Blamphayne Sawmills Ltd. The Neris, with its attractive bow top diamond trellis is one of our most popular panels. Available sizes: (1790 wide x 1800 high & 1790 wide x 1125 high). Treated in a natural green colour for longevity with a morticed and tenoned jointed frame. The panels bow top is ideal for creating an interesting and decorative boundary.